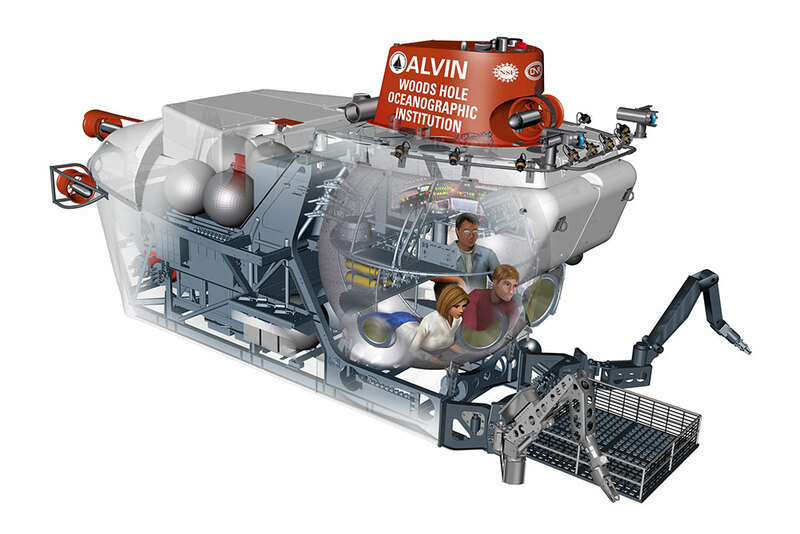 The whole objective of this research cruise is to test a newly rebuilt Alvin equipped with upgraded systems that had never been used before by scientists under field conditions. Scientists and engineers expected hiccups and learning curves. After four test dives of Alvin, it was time to tweak, troubleshoot, and optimize. 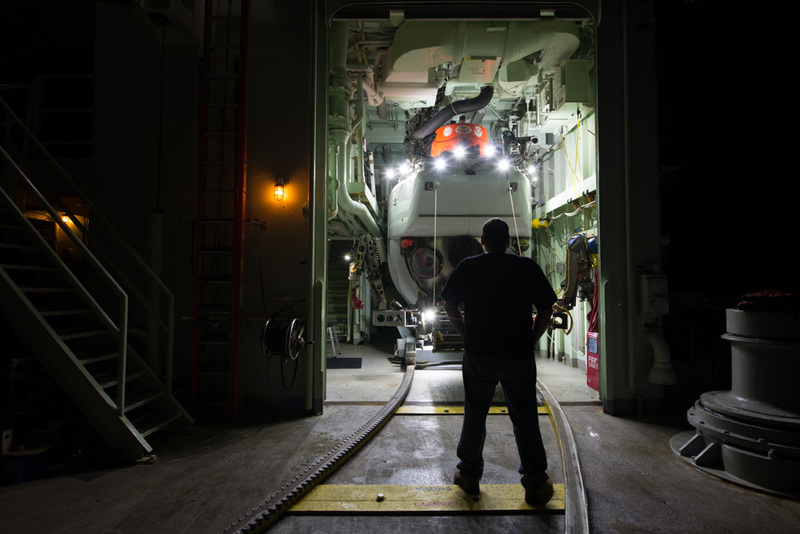 Thursday’s dive was postponed while the research team analyzed glitches in data collection, organized experiments with lighting, and assessed the research vessel Atlantis’ system to launch and recover Alvin, which had also undergone significant changes to accommodate the new sub. On Alvin’s first dive last Saturday, WHOI scientist Susan Humphris tried out the sub’s new high-definition camera and LED lighting systems right away. “Scientists get their most value by zooming in—on tiny animals living on the rim of a tubeworm, for example,” German said. So on Alvin’s second dive Monday, he found an interestingly patterned starfish to experiment with. At some point when he zoomed in, the image began to blur. “There wasn’t enough illumination to get the crisp focus we want when we are zoomed all the way in, even though when we zoom out far enough to look at the whole starfish, the video looks pretty cool. “So the options are to add lights, which draw more battery power, or try to do better with the lighting on the sub that we already had,” he said. Proceeding step by step, they tried option No. 2 on Alvin’s dive on Wednesday. Overnight between dives, the Alvin Group reoriented lighting on a bar above the sub’s forward-looking viewports. They aimed to provide more illumination on areas covered by the cameras on the side of Alvin’s payload basket. Amanda Demopoulos, a biologist at the U.S. Geological Survey, tried the experiment again, targeting small “ice worms.” These critters bore happily in gas hydrates—natural gas that has been solidified by the cold temperature and high pressure in the deep sea. The lighting revisions eliminated an annoying glare off Alvin’s basket that scientists saw on the previous day’s dive, but the changes still didn’t solve the zoom-focus problem. So it was time to try the next experiment: adding more lights. That required a complex and time-consuming process to rig additional electrical connections to power the lights. Engineers used Alvin’s off day Thursday to do that. Two additional lights were added on the sub’s basket below the viewports and cameras. The idea is to cast more light nearer to the seafloor and through fewer scattering particles of organic debris swirling through the water. The team of scientists and engineers thinks this should enhance imaging from the cameras just above the viewports and, in theory, also from the cameras on the brow of the sub. Engineers also attached another light on Alvin’s starboard arm, as pilots prefer to use the port one for manipulations. (Yes, Alvin is a lefty.) Again, in theory, any time Alvin pilots use the port arm to work around a seafloor site, scientists can also ask them to point the starboard arm to shine more light and enhance video quality. This verification cruise has also provided the first field tests of the sub’s complex new system to collect the flood of video streaming from the new camera systems, as well as the data recorded from all the submarine’s instruments and sensors. As the research team examined the video recordings from Alvin’s first four dives, they discovered gaps in the data stream. That’s why WHOI engineer Jonathan Howland, with long experience developing data-collection systems on NDSF vehicles, was asked to join the expedition. Thursday was also a day to assess Atlantis’ system to launch and recover Alvin, which was also significantly upgraded to accommodate the new, heavier sub. The ship’s A-frame, for example, was overhauled. This gargantuan lift hoists the 43,000-pound sub off the deck and moves it off the stern. Thicker steel was added to reinforce the lower part of the A-frame. New cylinders that move the A-frame out over the water, as well as other components, were installed. Thursday was a day to take a close inspection of this enormous and complex system and assess how it was performing after a few initial runs with the new sub, before getting ready to launch and recover Alvin again on Friday.